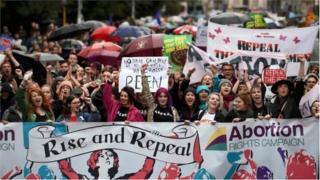 A body set up advise the Irish government on constitutional change has voted to replace or amend the part of Ireland's Constitution which strictly limits the availability of abortion. Abortion is only legal in the Republic of Ireland if the mother's life is at risk. The Citizens' Assembly - made up of 99 members and a chairperson- voted in favour of the change on Saturday. RTÉ reports that 91 members took part in the secret ballot. Some 44% voted to repeal or delete Article 40.3.3 of the basic law and 56% voted in favour of replacing or amending it. It will now discuss the recommendations it will make to legislators in more detail.